Patient photo identification on the front of each tray helps minimise medication mistakes. 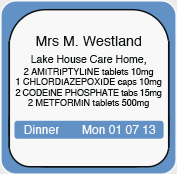 Identify a resident’s meds at a glance to make round times more efficient. Pods are colour coded making it easy to distinguish between different dosage times whether breakfast, lunch, dinner or evening. Pods are treated with a silver based anti-microbial agent that protects against MRSA. Plus, Biodose reduces infection risk by eliminating the need to repeatedly open and close the same medicine bottle. Liquids are dispensed in pre-measured Biodose pods, meaning no more sticky fingers & trollies, spills, inaccurate dosing, or searching for spoons during the drug round. Each pod can contain nine or more tablets or capsules, or 10ml of liquid medication. Every individual pod is secured with a tamper-evident, patented seal. Voted by 85% of pharmacies as ‘better’ or ‘much better’ than any other medication management device, Biodose remains the ‘best in class’ MDS available. Biodose combines the tried-and-tested MAR with ingenious personalised packaging and the expertise of your local pharmacist. The only monitored dosage system on the market to accommodate liquid and solid medication. Copyright© Biodose 2018. All Rights Reserved.